The European Marine Board is a unique strategic pan-European Forum for seas and ocean research and technology. We provide a strategic forum to develop marine research foresight, initiate state-of-the-art analyses and translate these into clear policy recommendations to European institutions as well as national government s.
As an independent non-governmental advisory body, the European Marine Board transfers knowledge between the scientific community and decision makers, promoting Europe’s leadership in marine research and technology. 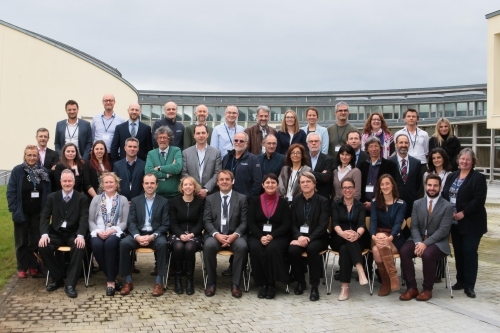 Voice – expressing a collective vision of European marine research priorities to meet future science and societal challenges and opportunities. EMB has an outstanding reputation as a provider of high-quality science-policy advice. Our publications are designed for a non-technical audience, providing recommendations for future research and capacity building which can be addressed by European and national funding mechanisms. A brief summary of some recent EMB activities and their impacts in the landscape are explained in this document (July 2018). We facilitate the transfer of the best scientific knowledge available to the core of marine research policy. This is done by interacting directly with decision makers, and steering discussions between scientists and policy makers on a certain topic. We represent the European marine scientific community in different events and our network is our primary pool of experts. The European Marine Board's collaborations reach far beyond its membership, bringing together a diversity of partners and stakeholders from the marine and maritime communities, European networks, as well as policy and decision makers. Our stakeholders include our members (representing around 10,000 scientists and technical staff), partner European and international networks, policymakers, strategy developers and programme managers at national, European and international level, as well as the marine and maritime science community at large. EMB member organizations form the Governing Board: its highest decision making body. The Board appoints the members of the Executive Committee (ExCom). ExCom is the body which makes sure that the decisions taken by the Board are executed. The EMB Secretariat takes care of the day-to-day management of EMB. EMB expert panels are open-ended pan-European networks focused on a particular topic and facilitated by the EMB Secretariat. Is your organisation interested in joining EMB? You can find out how here. You can find out more about current EMB activities by subscribing to our newsletter using this link. You can also check out our Annual Reports and other communication material here. EMB can trace its history since 1995. Learn more about EMB’s past here.